Spectacular. Brian Ray has created an album which is fun, touching, thought-provoking and outstandingly original. It’s awash with electric guitars and groovy old school production. The well-written and finely crafted lyrics make the songs boldly memorable and remarkably unpretentious. Brian Ray’s vocals are beautifully full and purely melodic with an inviting and compelling Rock ‘n’ Roll edge. The background harmonies are exquisite. Ray expresses himself very clearly. “Happy Ending,” an edgy Rock tune brimming with innuendo and passion, is about the emptiness of casual Internet dating and how he dreams of true love and a fairytale ending. A funky beat-box gives the song a catchy hip-hop flare. “Hello Lonely” is a beautifully touching love song with a mesmerizingly heartfelt vocal. The lyrics are captivating and soulful. It’s a power ballad with exquisite guitar solos and breathtaking imagery. being yourself is joyfully expressed. “Camouflage” is pure Rock genius with an enthralling edginess. The lyrics are about being real and genuine without having to hide our true selves. The vocal is mesmerizing and unforgettable. The drums and special effects make it even more remarkable. This Way Up” is a delightful Rock & Roll treasure and a musical delight. It’s a joy to hear so much pure rock in one album. It’s a new rock classic. 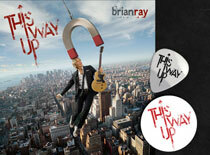 If you love Guitar Rock, You will love Brian Ray.